Challenge #01962-E138: John Carter Was HeresteemCreated with Sketch. "Early explorers of the Barsoomian plains made the mistake of assuming that the land was both hostile, and full of predators. Though the Martian tundra is hostile to human life, we can easily see the ecology surrounding us." Apparently grey rocks moved in the distance. "This... is a a herd of wild Thoat, once domesticated by the Barsoomai people. As you can see, their coats give them excellent camouflage in the plains." At the edge of the herd, a thick head raised as it chewed the red foliage that was abundant on the plains. "The lead mare has sensed a threat," said the nature commentator. The camera swung around to reveal... "A small pride of Banth have selected their prey. While Banth are excellent pursuit predators, they prefer ambush as a tactic, since it helps preserve the protective layer of blubber underneath their furless hides." The herd of Thoat took off after their leader launched themselves away from the Banth, and the pride was forced to give chase. "The Thoat has one great strategy for avoiding attack, and that is to head directly into the forest, where swarms of wasp-like Sith are likely to have their hives. Now, the original settlers came across the larger, male drones who also had the duty of defending the hives, but the more normal female swarm members are smaller, and far more harmless. Though their jaws can deliver an impressively discouraging pinch." After about half the Thoat herd entered the trees, swarms of insects emerged from the trees around most of the following herd. "But in this case, it's too late for an elderly male." There was a sprawled, grey body on the plains, and the females of the Banth pride were dragging their young out of hiding by their necks so that they could enjoy the feast. The camera flew closer, staying well out of range of the beasts. "This is not just a feast for the Banth," continued the narrator, as the camera found some tiny heads poking out of a burrow. "This family of Ulsio will likely pick up the Banth pride's leavings. Starting with the discarded intestines..." One terrier-sized beast scurried between Banth legs, avoiding their claws and attention, and tugged at the innards, unravelling the intestines as they dragged it back to their burrow. As soon as the scout was clear of the feasting pride, other Ulsio joined in with the tug of war. "Though the offal is part of the Ulsio's omnivorous diet, the burrow will feast on the stomach contents. They won't discard the partially digested dung... because these industrious burrowers... are also farmers." Now the documentary cut to a studio shot of an Ulsio burrow, where a similar family was busy dragging a similar intestine to its destination. An elder of the burrow edited part of the intestine from another, and a junior balled up the spill with straw and Ulsio dung, to roll it after the lower intestine. "Some of the family eats now. Starting with the Ulsio pups, who are still relatively helpless. It doesn't matter who their mother is, because all the Ulsio with milk will feed a pup that's still nursing." Some older pups were guided to the great balloon of the Thoat's stomach, where they began to blindly bite and gnaw. "These older ones have their teeth, but their eyes have yet to open. Therefore, it's a grandparent's duty to put food in front of them." One pup defecated, and an elder policed the dung. "And clean up the nest." A clever camera arrangement followed this elder down to the farm. Where other Ulsio were tending to a fungal garden. "And this is the farm. All dung is mixed in a special chamber butting on to this one, and there is always one or two Ulsio fertilising the garden beds. As you can see, they tend to several types of fungus, that also enrich the plains soil and encourage the foliage above to grow... abundantly." One fungus didn't belong, and was quickly excised by a burrow member. "This one, a product of their own intestinal systems, is poison. This mother will summarily eject it from the burrow." The cameras followed her as she did exactly that, racing to the mouth of the burrow to scurry far from there to bury it in the dryer surface soil. "The bloom will die, here, but it will assist with the growth of the very plants that the Thoat have so recently demolished." Time lapse footage of the fungal bloom dying as the surface plant's roots soaked up its residue. And new growth issued forth. 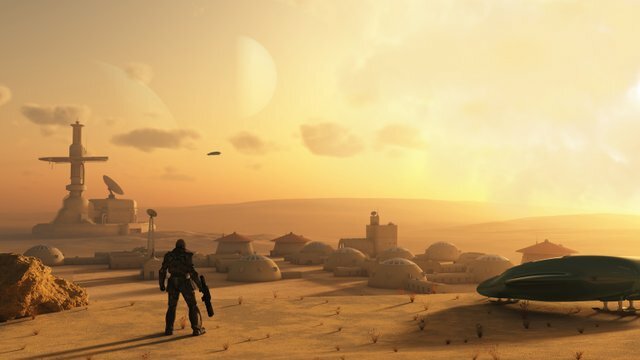 "Though Mars had been dwindling when Terrans began colonising it, the terraforming efforts have provided a stabilising effect for the ecology. It is a great pity that the Barsoomai, the original inhabitants, could not do so for themselves."